The movie starts very much like The Hound of the Baskervilles. There is something that is out there. The music is eerie. Two sheep have had their throats torn out. Soon the Lady Penrose is found dead. Luckily Sherlock Holmes and Dr. Watson are in Canada at a meeting of the Royal Canadian Occult Society. One hundred years ago there were murders at La Morte Rouge and now they are starting again. Holmes gets a letter from the dead woman who had a premonition of her death. Holmes comments to Watson, "Consider the tragic irony: we've accepted a commission from a victim to find her murderer. For the first time we've been retained by a corpse." 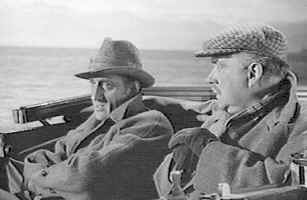 Holmes and Watson begin the investigation without the help of the husband, who quickly becomes a suspect. Watson gets drunk with the locals at the pub. He fills them in on his detective abilities. When he finds Holmes is out on marsh by himself he rushes to join him (where he falls into a bog), Meanwhile Holmes sees glowing creature running across moor and fires at it. He finds a glowing piece of cloth. We find out that the psychopath killer is a former actor, playing a variety of roles in town. He uses a claw to kill his victims. He had been in love with the Lady Penrose. He corners Holmes at gun point but a bumbling Watson again saves the day. Sherlock Holmes: Relations of friendly intimacy with the United States on the one hand and their unswerving fidelity to the British commonwealth and the motherland on the other. Canada, the link which joins together these great branches of the human family. Dr. John H. Watson: Churchill say that? Sherlock Holmes: Yes, Watson, Churchill.